I’m going to try something that may be a total failure, but I’m okay with that. I want to try an interactive type blog post. In other words, I want to do very little writing and see if I can get some folks to comment for me. So, just go to the comments section and give me some answers. I’ve been thinking about a question today, and I wonder what people might say. I have my thoughts, but I’ve learned that thoughts about God are usually best sorted out among a community of believers. Therefore, I would like to submit a thought to my virtual community of believers. Fill the blank in the comments section for me. I want to know when you think a person looks the most like Christ. You are most Christ-like when you _______________. I have always wanted to be epic, but the truth is, I’ve always been average. I always wanted to be a home-run hitter, but I was the guy who just got base-hits. I want to be a long driver on the golf course, but I just punch one out there about an average distance, most of the time less than average. I always wanted to be tall, but I’m an average 5’-10”. I want to be thin and trim, but I’m an average 34×32 pant size. Large shirts, normal build, average income, average life…you get the point. I have talked to my wife before about this and she also feels the struggle of average. She wakes up every day and does essentially the same thing. Feed kids, change kids, play with kids, get a kid to school, clean up behind them…rinse and repeat. Average. So recently with my small group we dwelled in the text of 2 Corinthians 4. It was striking to me how many people were drawn to and questioned this idea of treasure in clay jars. 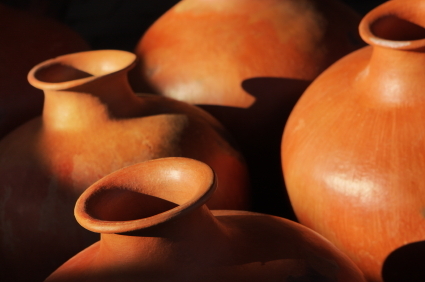 Who puts their fine treasure in jars of clay? They’re ugly, brown, and really not extremely sturdy. Why put a treasure there? Why not a locked fireproof box? “But we have these treasures in beautiful ornate chests that are securely locked and cannot be broken.” That sounds more appropriate, more epic. But no, just a clay jar. A boring, brown, average clay jar. I’ve been living under 2 Corinthians 4 this week and thinking about this text. It strikes me that God puts this treasure in average clay jars like us, because that is the very nature of the kingdom of God. As I’ve said before and many have said before me, God always comes in the average. He is in the silence, the manger, the tiny town of Bethlehem, the mustard seeds, bread and wine, and other average means. Such is the kingdom of God. So it makes sense, only in the kingdom, that we have this treasure in jars of clay, so that it is clearly seen that this all-surpassing power is truly from God and nothing else. This world doesn’t rely on our faith, but on God’s faithfulness. So, join me today in finding the epic-ness of averageness. If you’re a stay-at-home mom, a nurse, a number cruncher, a landscaper, a business executive, a salesman, or any other average task that you find yourself doing, remember that it is in these very mundane and average things that God often works. Love your kids well today, play hard with them, be extra kind to your cubicle neighbor, tip a little extra at lunch, speak words of hope to someone hopeless, sit with someone grieving at the water cooler, go the extra mile, turn the other cheek. Pay attention today to the opportunities to be given over to death for Jesus’ sake, so that life may be revealed in these average and mortal bodies.